The Holy Bible: New Revised Standard Version. (1989). (Jn 2:13–22). Nashville: Thomas Nelson Publishers. The majesty of Jesus must have rivaled his baptism and transfiguration the day he walked into Jerusalem and cleaned out the Temple. It is hard for me to imagine how the well-established religious practice could be so easily overturned without a significant and maybe even violent response. Something very different happens though. Instead of fighting back, the people simply ask for a sign, the way a person asks the police for a warrant if they want to enter a home. It is almost as if they were expecting someone to get around to this sometime or another. They were less concerned about the action and more concerned with Who was carrying out that action. Why is that, I wonder? I think maybe they felt like the Temple was like a great grandmother’s prize china dishes which had been pawned away to someone else who did not know the sentimental value of them. Perhaps they were being used for common meals: tv dinners and delivery pizza. You know that these dishes need to be specially cleaned, but you don’t trust just anyone to do it. You might be afraid that, in a clumsy attempt to make things better, they might actually be marred worse, or perhaps even broke. The answer Jesus gives is: go ahead and break them all, and in three days, I will remake them again. Part of what makes his answer ridiculous is not just that it takes more than 3 days to build something like the Temple in Jerusalem. It is that the stones themselves have memories attached to them. There are things about the structure itself and the experiences that took place there that could never be replaced. Sentimental value cannot simply be remade. What if some of the things we hold most dear are some of the things that need to be cleaned up the most? What if the kind of cleansing we need is not soap and water, but a grinding stone and a forge? Would we trust Jesus enough to hand our most precious things in life knowing He held a hammer in one hand and a blowtorch in the other? More importantly, do we believe that, after all that, He could put us back together again, better than we are today? 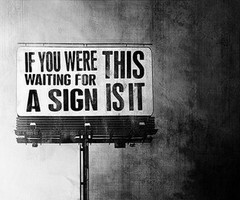 Perhaps you and I would ask for a sign also.